Dr. Martin Luther King, Jr. was the son of Reverend Martin Luther King; the father (Rev. King) was the author of Daddy King: An Autobiography (1980). Please preserve the distinction between these authors. Martin Luther King has a Legacy Library. Legacy libraries are the personal libraries of famous readers, entered by LibraryThing members from the Legacy Libraries group. 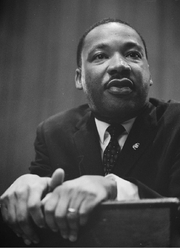 » Martin Luther King's legacy profile. » Martin Luther King's profile. » Martin Luther King's catalog. Martin Luther King is currently considered a "single author." If one or more works are by a distinct, homonymous authors, go ahead and split the author. Martin Luther King is composed of 1 name.